Interested in her talk? Check it out on YouTube! 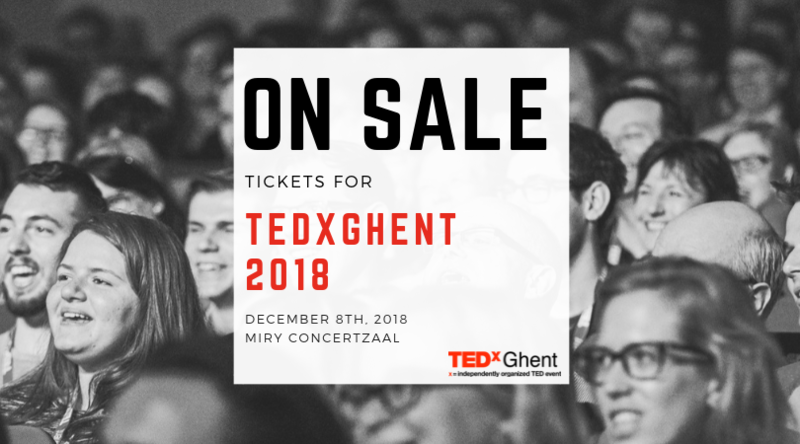 to be an official speaker at this year’s TEDxGhent main event #bitsoflove, I faced the challenge to sum up my personal story and at the same time present my “idea worth spreading”. 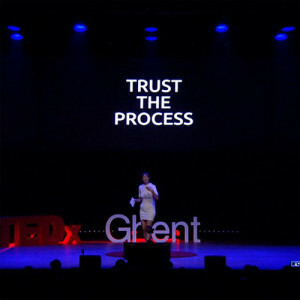 As a transdisciplinary artist, my curiosity led me into so many fields – all connected in my understanding, so the only solution was to invite the audience to a multidimensional journey through a universe of creativity. 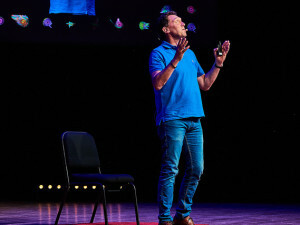 In this article I want to give an insight on how my talk “Why waves make sense to me” came to life and who supported me and shared a wavelength on the path of creation. started early when I was a kid and it was a natural consequence for me to undertake a professional musician and audio engineer career, to be able to share wavelengths in music studios with other musicians and producers. 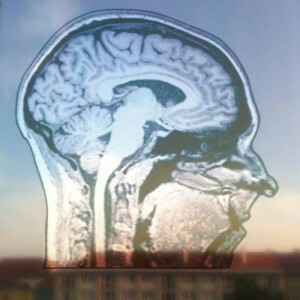 My passion moved further and during my media art studies at the Academy of Fine Arts in Munich, I started collaborating with scientists and engineers to re-contextualize the perception of various fields of expertise and techniques, making those accessible and tangible for an audience. This led to a point where any kind of material, be it physical or non-physical, awakens my curiosity, pushing me to find out how it can be translated into sound and audiovisual pieces. Following this path, I found the “main ingredient”, my personal “theory of everything”: Waves. I furthermore realized that for reaching big and visionary goals, I need others to help me on the way to fulfilment. Receivers who team up and share a wavelength. 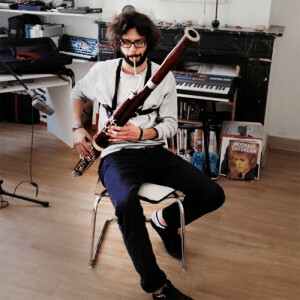 I met Wang-Him Yip, a video documentarist, who later introduced me to Marcello Giannandrea, an Italian bassoon player and sound explorer. 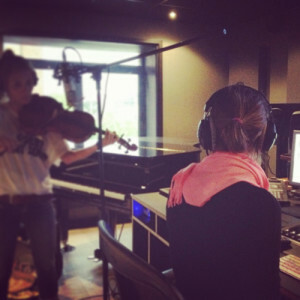 In my studio, provided by Nicolas Wierinck of Cimatics and Morpho, we started experimenting on a regular basis and he introduced me to Vanessa Di Fine (violin) and Tea Plesničar (harp & poetry) whom he met at the Royal Conservatory in Brussels. 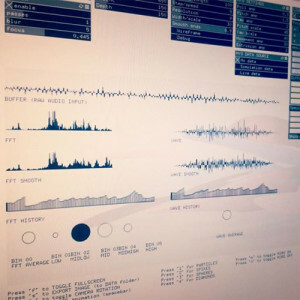 The vision of Permeable was born: a transdisciplinary art collective which aims to fusion classical music, sound-art, poetry and contemporary electronic music production, resulting in immersive multi-sensory experiences. to meet my friend and actor Sam Louwyck and put my feet in the waves of the north sea. 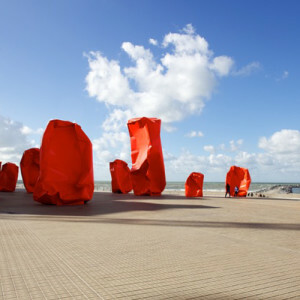 And that’s where I found it, or it found me: my new object of fascination, the waves of the Rock Strangers Oostende, a public art sculpture made by the internationally recognized Belgian artist Arne Quinze. I was invited to explore the waves of the prototypes in his atelier in Sint-Martens-Latem, near Ghent, together with percussionist Guillaume Vanespen and record the first samples using my mobile studio. I was amazed by the vibration of his sculptures and so were Arne Quinze and his partner in crime, Dave Bruel. 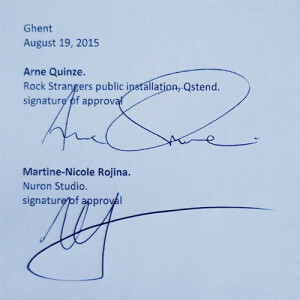 I got the official permission to play, record and compose with the Rock Strangers Oostende! 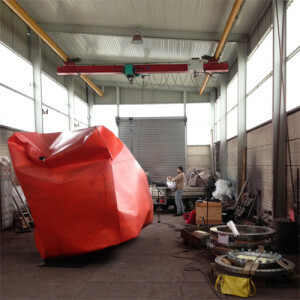 with drummer and percussionist Francesco Cigana, whom Marcello invited to Belgium as he perceived “Ciga” as my “brother from another mother” and we continued the exploration of the sound spectrum of the sculptures at their actual birthplace: the metal factory Melens & Dejardin in Liége (the second atelier of Arne Quinze). 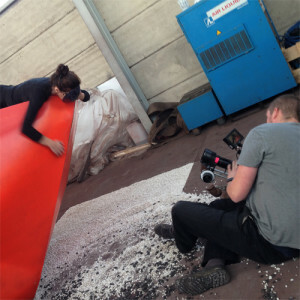 and the creation process to propose our idea to the city of Oostende with the help of movie producer Ben Vandendaele (Bekke Films), Director Of Photography Julien Cherpion (Shimera Films) & Dave Bruel with additional performances by Hadassa & Ester DeKoning and Cigdem Y Mirol. 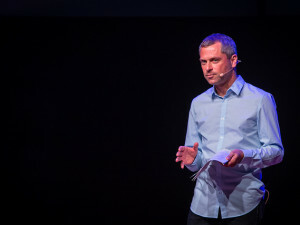 of Jan Hameeuw, head of the innovative film postproduction and coproduction house TheFridge in Brussels, as well as the organisational skills of Leslie Foubert, we managed file handling, editing supervision and colour correction made by Nick Fortemps. 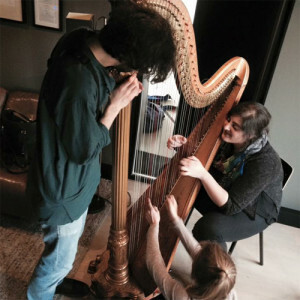 in Brussels, we composed the soundtrack which included the sculpture as a music instrument, accompanied by bassoon, harp, violin and voice. 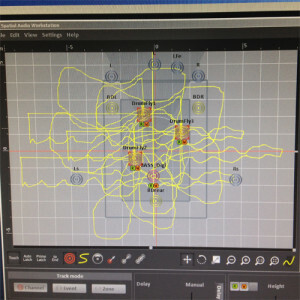 Because of the winter holidays, every Permeable member was in their home-country and had to send their recordings to me, like a long-distance wave transmission. of the City of Oostende, Martine Meire, we are now official “sculpture musicians” and in the work in progress towards the live performance scheduled for late summer 2017.
and Dave Bruel introduced me to Reggy Mortier from Barco, a global company with headquarters in Belgium, which designs and develops AV technologies and was reaching out for collaborations with inventive artists. 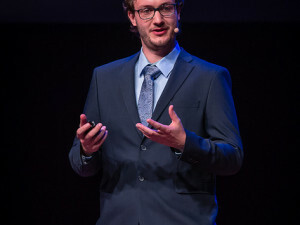 Having already partnered up with TEDxGhent, Reggy connected the dots and introduced my vision to curator Ruben Verhack and technical director Niels Van Kets, as he thought we would share a wavelength in our love for technology, education and design. 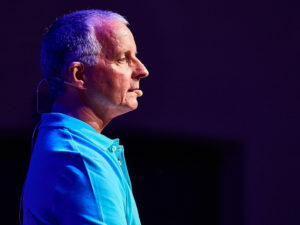 After a first fascinating and exciting meeting, where I proposed the draft of my talk about “the power of waves”, they asked me to be a speaker at their main event #bitsoflove in Ghent in June 2016. Being a TED addict for many years, again one of my dreams became reality. 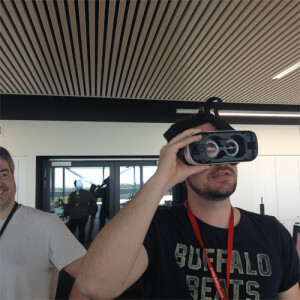 Augustin Grillet and Wim Vandamme were excited to create content for their triple screen panoramic setup and Julien Cherpion, Cedric de Pierpont and me went to Barco´s new campus to experiment with a drone camera and discuss further film shooting options. 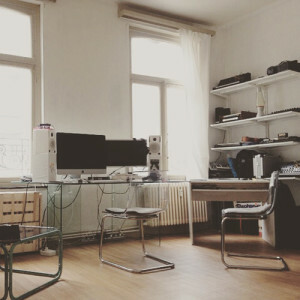 Barco Audio Technologies based in Erfurt, Germany, were eager to work with unique music. 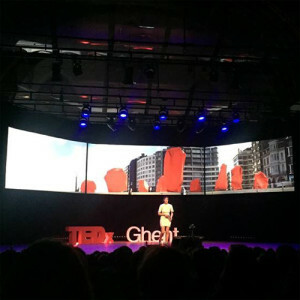 Especially composed for their spatial object-based three-dimensional immersive audio system, using more than 100 speakers above, below and around the audience at the concert hall of TEDxGhent’s venue de Bijloke in Ghent. and provide this innovative perception to the participating musicians? Facing this challenge, only one professional music studio with a creative atmosphere and at least a 5.1 surround setup seemed a perfect match: Peter Baert’s wonderful Raygun Studios in Brussels. We shared the passion and fascination for sound-art and particular music composition from the second we met and he trustfully granted me access to his equipment. 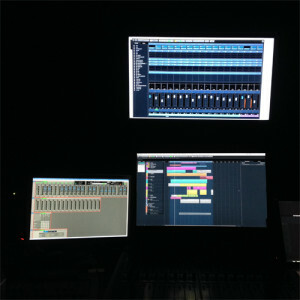 had to be created, now that I knew that the music production was in flow. 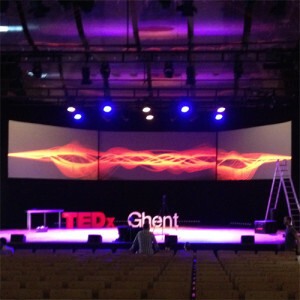 In Ghent I met Gwen Vanhee from nøcomputer to discuss audio-reactive visuals, which would bring all the waves mentioned in the talk to life. 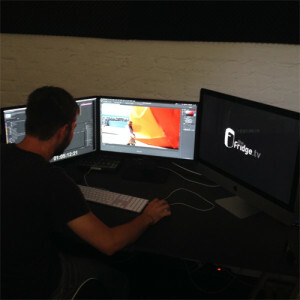 They would have to work hand in hand with the 2D and 3D animations created at TheFridge in Brussels by Tom Willekens and Kenneth Dingens, where I would edit on a pre-recorded voice-over version of my talk with Robin Van den Acker. an incredible moment of synchronicity happened: the same second I decided to show a picture of a surfer on the screens, out of the blue my friend Christian Kruse sent me a vimeo link of his latest mini documentary starring Kadri Kurgun, a photographer, yogi and professional surfer. I couldn’t believe that Kadri said almost exactly the same words I had written down and was happy that he allowed me to use his images and quote for the talk. everything seemed to build up on each other as fashion designer Jasna Rok answered an email I wrote already months ago: Reggy told me back then that Jasna and me were busy transforming brainwaves into art. We met up in Antwerp and our mutual understanding made clear that I would turn into a light sculpture wearing her “fashion on brainwaves” on the TEDx stage. 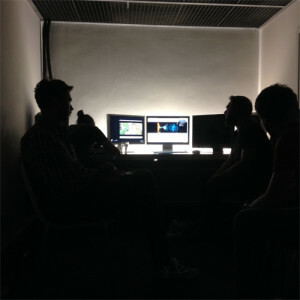 we had one week to dig into an intense recording process. The low male voice frequencies I recorded of Sam Louwyk melted powerfully with the sounds of the Rock Strangers and with the epic musical journey of Permeable and we enriched the string and choir sections with the viola and voice of Nicole Miller. 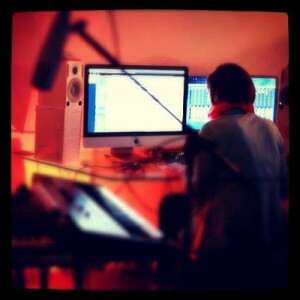 in a surround setup, with the help of music producer and sound designer Michael Meinl from Munich. So I was ready to take the train to Erfurt, to translate our three-dimensional sound fantasies to real technology. 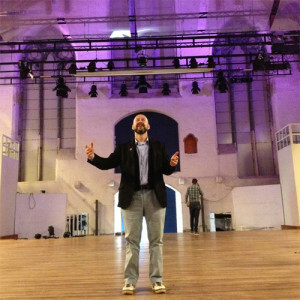 with the help of Olaf Stepputat, Stephan Mauer and Max Roehrbein from Barco Audio Technologies and could distribute the mix onto the object-based speaker system we would use in de Bijloke in Ghent. 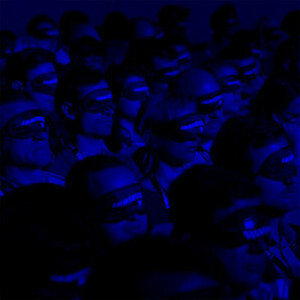 My goal was to create a space full of frequencies all around the audience, who would then be blindfolded with sleeping masks to enhance their auditive perception. and editing in TheFridge in Brussels and exchanged all technical details with B.immersed and Bavo Loccufier from Bitstream, the event company which would film my talk and provide the triple-screen panoramic setup. two days before the talk, heard the three-dimensional music and watched the movie without my pre-recorded voice for the first time and were amazed. All of the creative and technological puzzle pieces and expertise came together and a vision became reality. and saw my dear hero Albert Einstein on the teleprompter in front of me. I knew that, except for me and my team, this journey would be a premiere for the audience. I hoped that they would be carried away by the powerful images on the screens, forget about the presenter, understand the bigger picture and trust me enough to blindly follow their own waves during the immersive music piece. I felt cosy wearing the most comfortable “homie-dress” of the future that translated my brainwaves into colours. This dress competed my beliefs about authentic, vulnerable, empathic and truthful communication as the key of sharing a wavelength in this universe. 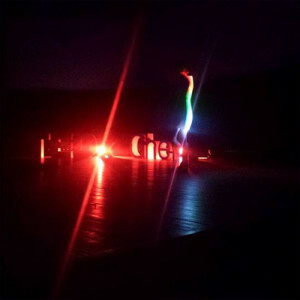 and saw 700 people with a profoundly relaxed face under their sleeping masks, knowing that I would wake them up as a futuristic light sculpture, I felt the pressure of the last 12 weeks fading away. made me proud of this incredible journey we all took together.